Obviously by the description this is not the same old Alice in Wonderland that was expected. Alice has returned and apparently by the end seems to be a warrior or “champion” as the White Queen (portrayed by Anne Hathaway) refers to her. I personally am a FREAK for all things Alice so this new imagining looks amazing! I love Helena’s Head! 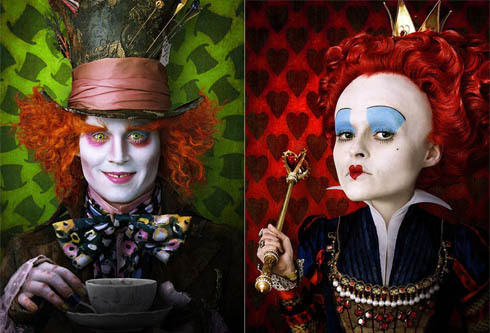 I also can’t wait for Alice in Wonderland to hit theaters. The debut of the trailer couldn’t be more perfectly timed – astrologically that is! Seems there was an aspect highlighting talent and genius, then Johnny Depp’s face came up – all up – in the trailer. If it weren’t for Helena’s Head I would’ve missed her. I’ve featured Depp’s Astro chart in my blog at: http://nudeprovacateuse.wordpress.com/. I’ll be checking back.